Related party transactions are a common feature of pump-and-dumps. Nefarious issuers may sell securities to their fiduciaries, affiliates, or family — without disclosure to other buyers. These schemes can create the illusion that a security has a broader and deeper market than reality. Thin floats also make it easier for manipulators to create price momentum. Because of their pseudonymity, it’s hard to rule out related-party transactions and wash trading in crypto-assets. Usually investors only have founders’ words to rely on. In the case of Ethereum, some of their words are troubling. To be clear, this post is speculative and I have no evidence of Ethereum founders acting nefariously. There’s also nothing necessarily wrong with fiduciaries trading their own security, as long as it’s properly disclosed. But if I were an investor or regulator, I’d want to know more about some of the facts below. Crypto-industry insiders believe he may be the single-largest holder of Ether, with valuations as high as $10 billion, but Lubin insists he’s been selling. The tokens sale went off without a hitch, selling at about 30 cents apiece and raising $18m. The founders all bought large holdings in the newly created currency. Q: Will there be a limit on the amount that a person can invest in Ethereum? Lubin: A person can buy from any number of different identities. We may limit the size — the unit size of a sale — just to make it easier to disguise. Let’s say if you’re a whale and you want some privacy, you can buy 50,000 units, just so nobody scares people with an enormous purchase. So if you are a whale, if you’re planning on investing several billion US dollars worth, then you can do that with multiple identities. We will ask for real-world identities in the form of an email address, just so that we can make sure that everything works smoothly… But we won’t be requiring it. So you can create a pseudonoymous email identity and actually purchase from it. He worked as a software engineer before ending up on Wall Street, where he managed IT projects for Goldman Sachs’s wealth management division. The job piqued his interest in finance. He left Goldman and founded and ran a few hedge funds, which used a controversial trading strategy that took advantage of mutual fund price inefficiencies. Could that indicate that Lubin’s hedge funds engaged in mutual fund timing? I don’t know, but it might fit with his above statement about disguising order flow with multiple pseudonymous accounts. Mutual fund timers have employed similar schemes. [P]utting aside the fundraising that accompanied the creation of Ether, based on my understanding of the present state of Ether, the Ethereum network and its decentralized structure, current offers and sales of Ether are not securities transactions. And, as with Bitcoin, applying the disclosure regime of the federal securities laws to current transactions in Ether would seem to add little value. If ETH ownership is (or was) more concentrated than he thought, would that change his view? Many ETH investors are hoping for further development from the Ethereum team, including dividends via the promised fork(s) that enable sharding, Casper FFG, proof-of-stake, etc. These efforts (and their promotion) are not just performed by the Ethereum Foundation, but also ConsenSys — which Laura Shin reports is partly funded from Lubin’s personal sales of ETH on the secondary market. So Ethereum founders may be trading tokens while possessing special information about future dividends and their own forward-looking statements. Again, there may be nothing nefarious going on here, but the community might be interested in seeing founders’ trading activity. If Ether is a security, then this disclosure is probably mandatory. But even if securities laws aren’t applied to ETH, the market could potentially demand that information. Paranoia can help people navigate the traditional financial system. Though usually participants’ darkest anxieties don’t keep them from losing anything except a good night’s sleep. The crypto financial system has the opposite problem. Seasoned crypto participants imagine wild conspiracies plotting to take their money , and yet sometimes their conspiracy theories aren’t crazy enough. It may seem far-fetched that ETH is closely-held, but investors would be naive not to ask. [P]resent-day me does NOT endorse everything that we did in the 2014 presale. For example the lack of lockup periods for founders was not good imo. Forks are often equated to dividends. One year, with respect to Ethereum: we’re going to replace the proof work algorithm with a much more efficient proof of stake algorithm. So that’s going to give us greater scalability. Roubini: Five years ago, Vitalik Buterin said ‘We’ll find the solution to scalability, right. It’s going to be proof-of-stake.’ Five years later, you’re telling me it’s going to come now. It hasn’t been there. So that problem of scalability with decentralization, security has not been resolved. And will never be resolved. Lubin: I can show you the code. Roubini: Come on. You’ve been saying these things for five years. Come on, five years. And we don’t have it yet. This entry was posted in Uncategorized on August 13, 2018 by Kipp Rogers. Ether will be released in a currency sale at the price of 1000-2000 ether per BTC, a mechanism intended to fund the Ethereum organization and pay for development that has been used with success by other platforms such as Mastercoin and NXT. Earlier buyers will benefit from larger discounts. The BTC received from the sale will be used entirely to pay salaries and bounties to developers and invested into various for-profit and non-profit projects in the Ethereum and cryptocurrency ecosystem. An investment contract is an investment of money in a common enterprise with a reasonable expectation of profits to be derived from the entrepreneurial or managerial efforts of others. Investment contracts are securities in the US. Ether is a product, NOT a security or investment offering… The Terms and Conditions of the Ethereum Genesis Sale, and the Ether Product Purchase Agreement, are the only authoritative documents regarding the sale. Any statements that we have made up to this point are null and void. The ethereum.org website, the blog posts since Taylor Gerring’s recent howto and other posts we have made on various forums including our forum and reddit are to be treated as informal communications designed to keep the community updated on what is happening with Ethereum. Parties may be interested in purchasing ETH… to support the development of the Ethereum Platform. The ETH offering was also not an unregistered SAFT. A SAFT is an untested structure that could fund a coin’s development with a securities offering, and later delivers a finished coin. A coin initially funded by a SAFT *might* not be a security, if “entrepreneurial or managerial efforts” truly do cease after the coin is distributed. When ETH officially launched, the foundation specifically said that it would continue developing Ethereum using funds raised from ETH sales. The foundation’s entrepreneurial and managerial activities continue today. So Ethereum entities made a cursory effort to claim that ETH isn’t a security, but before, during, and after the offering, they made it otherwise clear that ETH is a security. The following is just my general impression from reading ETH documents, and may have errors. The initial offering raised around 30k BTC, which I believe went to a variety of entities controlled by the Ethereum Foundation. Most of these BTC have been distributed to individuals or sold. ETH may be a security, but it is clearly not equity or debt. Normal equity gives owners exposure to all of a corporation’s unencumbered property. ETH gives owners exposure only to the project’s intangible property. Since the project is open source, it probably has limited intellectual property (though it does own trademarks). So, the majority of ETH’s value is derived from its brand, platform, and network. Parts of the crypto community may argue that this model is fundamentally new to markets. It doesn’t feel that way to me. Many of the most successful companies in the world derive their value from intangible assets. Danaylov: If our viewers and listeners were to take a single message from our one hour conversation with you today — like the most important thing that you’d like them to remember — what would that be? Buterin: Yeah. I would say it really boils down to this idea that Ethereum is not a currency… You can use it [decentralized consensus methodology] for so much more, and I think now is actually the time when we’re starting to move away from ‘Oh, let’s have a decentralized currency for decentralized currency’s own sake.’ And actually realize that there’s all sorts of these different applications where you can actually do so much that you can’t even do in the existing paradigm at all… One of the examples that I always like to bring up is actually gambling. So in 2006, if you wanted to make a gambling site, it would be extremely difficult… In 2012 it got a bit easier, because you got Bitcoin. And with Bitcoin, you can actually do all the currency part without most of the security, without the payment processing, and so forth. In 2014, guess what the gambling sites of the future are going to look like? They’re just going to be Ethereum contracts in 15 lines of code: write them once, click compile, click ‘push to blockchain,’ ‘push to blockchain’ returns to you an Ethereum address, paste the Ethereum address onto a forum, and bam, anyone can gamble. Danaylov: Well, well, I can see how the casinos are going to love you for that. But I’m personally one of those crazy people who believe that it’s good that it’s hard to get involved into gambling — online or offline. Buterin: It’s an example, alright. The idea is that you’re taking this industry — it’s actually very bad for consumers right now — because it’s very easy for gambling sites themselves to cheat… Gambling is such a nice example because it’s this sort of pure financial service. Buterin: So, a good example might be Kickstarter — is another one. So Kickstarter — once again, it’s a great idea — you can actually grab funding together from thousands of different people. People can start these large, well-funded projects without having to go to a VC. It’s good. But at the same time, it’s also inefficient… All the other sites take a pretty good cut too. And at the same time, they’re also geographically limited. There’s a lot of countries I’m sure you can’t really access them at all, right? So, ETH is supposedly valuable because it’s a platform for other platforms (some of which are, also, platforms for other platforms). It is perhaps more of a roll-down than roll-up. Regardless, the danger of this model makes it doubly important for market gatekeepers (e.g. lawyers, brokers, and exchanges) to do their jobs and ensure securities they help sell are reasonable and compliant. The SEC has made it clear that cryptoexchanges must be registered as ATSs or national securities exchanges if they enable exchange-like trading of securities. That is, if ETH is a security, every major American cryptovenue may be in violation of the law. I don’t know what the penalties would be for violating these (well-known) rules, but they might be higher for venues that understand ETH is a security. Coinbase is potentially one such example. Coinbase, in marketing ETH, pointed to its active developer community and leadership. Even a casual inspection would have revealed that ETH’s developers and leaders are partly funded through ETH sales. So, either Coinbase didn’t do the most basic diligence before helping retail investors purchase ETH, or they had good reason to believe that ETH was a security. Update: It appears that Coinbase did recognize that ETH development was financed by ETH sales from the primary offering and later sales in the secondary market. Coinbase also explicitly described ETH fundraising as analogous to traditional securities offerings. This history is particularly interesting in light of Coinbase’s recent Congressional testimony. It is easy to get frustrated with our regulatory regime. In one view, unethical participants ought to be deterred by markets’ self-policing mechanisms, so why should we burden ethical participants with all this red tape? It’s been nearly a century since the Great Depression — maybe humans have gotten smarter. Maybe we don’t need post-depression rules anymore. Cryptocurrencies have been a fascinating natural experiment on the consequences of a complete rollback of regulation. So far, the results are frightening. Perhaps the cryptomarket would eventually learn to police itself, but it increasingly looks like there’d be unacceptable carnage on the way. It’s time to end the experiment before too many people get hurt, and make cryptocurencies follow the same rules as everybody else. Then we can let the market determine their value. They [The SEC] have also begun an important process of drawing a distinction between “initial coin offerings” that are securities on the one hand, and decentralized cryptocurrencies on the other, which don’t fit the bill and are more suitably regulated as digital commodities such as digital gold (bitcoin), digital fuel (ether), or digital real estate (filecoin/storj). This post contains no advice to buy, sell, or trade securities, commodities, virtual currencies, derivatives, or other financial instruments. We have done even more work on the legal front. We have been working, and continue to work with lawyers in different countries to structure the pre-sale of ether so that it is not seen by securities regulators as an offering of securities. We believe that selling ETH, a fuel that powers applications on the Ethereum platform, does not constitute sale of a security, be we hope to achieve more certainty before starting the sale. Q: Why will these coins [founder grants] be spendable after one year and not immediately? Buterin: To prove to the world that we are not a pump and dump and are interested in Ethereum for the long term. Q: What benefits do you have of personally owning pre-mined coins? Buterin: What benefits do we have? We get profit if Ethereum succeeds; this is obvious. What benefit do you have? The assurance that the five originators of the project are heavily incentivized to do everything in their power to make as high quality a product as possible and not abandon it. Q: Why create a non-profit? Q: Why use a fundraiser? Buterin: To get funds to develop the protocol and applications around the protocol. Q: What’s to prevent this altcoin from developing the same benefits that Ethereum has? Buterin: Absolutely nothing. We’re even handicapping ourselves, just because everything we do is completely open source. If you’re investing in Ethereum, I would say you’re investing in the team and the community to a large extent. When purchasing ETH in the Genesis Sale, the buyer is supporting the development of the product, just as with a kickstarter campaign. The Ethereum Platform is being developed primarily by a volunteer contributor team — many of whom will be receiving gifts of ETH in acknowledgement of their dedication — and will continue to be developed on a volunteer basis by some developers as well as under a more formalized contracting or employment relationship for other developers. The group of developers and other personnel that is now, or will be, employed by, or contracted with, Ethereum Switzerland GmbH (“EthSuisse”) is termed the “Ethereum Team.” EthSuisse will be liquidated shortly after creation of genesis block, and EthSuisse anticipates (but does not guarantee) that after it is dissolved the Ethereum Platform will continue to be developed by persons and entities who support Ethereum, including both volunteers and developers who are paid by nonprofit entities interested in supporting the Ethereum Platform. The “intended uses of revenue” included development, outreach, research, and an allocation to a non-profit foundation. Page 4 of the DevPlan also describes their plans for 2 non-profit entities, a short-lived for-profit corporation, and an SRO. I’m not aware of any progress towards the SRO in the ensuing 4 years. It’s common in the cryptoverse to hear about SROs, but rare to actually see one. I received ~553,000 in the genesis premine and ~150,000 from the developer purchase program. I currently hold ~630,000 ETH. I’ve sold about a quarter of my ETH. Q: When do you expect that we could see an Ethereum future out there? Lubin: I think months would be a long, long time. To learn more about Ethereum, please visit our Ethereum FAQ page and co-founder Fred Ehrsam’s medium post “Ethereum is the Forefront of Digital Currency”. What is very real, though, is the possibility that Ethereum blows past Bitcoin entirely. There is nothing that Bitcoin can do which Ethereum can’t. While Ethereum is less battle tested, it is moving faster, has better leadership, and has more developer mindshare…. Miners also perform a service for Ethereum in exchange for new ETH tokens. It is not so different from a company paying contractors with newly-issued equity. Perhaps mining is a business activity funded by Ethereum issuing and selling securities? Most groups who have raised funds through a token sale create some kind of entity to handle the funds raised. The most common structure at the moment is setting up an (often Swiss) foundation. This foundation has some governance, much like the corporate governance you’d see in a normal company, which determines both the initial and ongoing distribution of funds raised. This is what Ethereum has done, more or less. If you want to make this analogous to kind of regular companies in the world, you can think about the proceeds — whether it’s Ether or dollars from the pre-sale — as like the cash that a company might raise. And then the tokens that they hold back as kind of like the options pool, more or less. One thing I think is interesting that we haven’t seen a whole lot of yet in the world is: (And this happens at companies and startups all the time) What happens when those initial funds from the initial fundraise run out? Right? There’s kind of this model at least so far — and these are all really early projects — of we just do one fundraise and hopefully that just funds the thing in perpetuity. I’m guessing that that will not continue forever. With Ethereum, one of the main reasons it’s worked so far is: just like a successful company, the Ether that the foundation holds have appreciated quite significantly in value — meaning they could continue to pay for development more and more and more. So one thing I’m quite interested in is: what happens in the future, when those initial funds that we held back start running out and we want to continue funding the development of these protocols. Lastly, one of the major use cases for Ethereum is decentralized fundraising from a global network of investors. Crowdsales lower the barrier to entry for developers working on high risk projects. Since Ethereum launched in July 2015 we have seen unprecedented amounts of funds raised for decentralized applications through crowdsales. Ethereum itself was funded through a crowdsale that raised $18 million in bitcoin and a project called The DAO raised $160 million. At Coinbase, we have worked to bring clarity to the issue of what assets we can support since 2016. To help potential market participants, we published our Digital Asset Framework to provide transparency about how we consider listing new assets. A key factor in our framework analysis is a determination that the potential new asset is not a security under U.S. law. This entry was posted in Uncategorized on March 13, 2018 by Kipp Rogers. A) If so, what is the nature of the prop-trading? Does it occur on your own exchange, other exchanges, or both? B) Are there information barriers between client data and prop-trading decisions? Are customers ever front-run? C) Does prop-trading have the same access to the exchange as other customers? D) Are exchange operational decisions, like pausing (or not pausing) matching due to IT issues, ever influenced by profit or loss by your prop-trading? E) Who oversees exchange prop-trading and ensures it is non-manipulative? Is oversight segregated from the rest of exchange operations? 2. Does your exchange offer securities trading functionality? A) If so, is the exchange registered and approved by the appropriate regulators? For example, if the exchange is in the US and matches Ether (likely a security in the US ), is it registered as an ATS, National Securities Exchange, OTC market, Broker-Dealer, or otherwise? B) Are the securities classified as penny stocks, NMS stocks, Regulation A stocks, or another type of stock? C) What standards determine the securities that the exchange matches? E) Does the exchange report suspected insider trading to the appropriate regulators? Are exchange employees monitored to prevent them from insider trading? 3. For exchanges offering execution services such as Coinbase, how is the execution price determined? A) Is the customer executed at the worst price over a lookback period? What is the lookback period, and can it vary? C) Are details like the above, and any additional spreads, fully disclosed to customers? D) If you offer execution services for securities such as Ether, do they comply with best-execution requirements? Are you registered as a broker? Do your retail customers understand any risks of using your services? 4. Do clients have equal access to the exchange? A) Can every client access the same market data feeds and order entry gateways? At similar latencies? B) Do any clients receive different fees than the public fee schedule? C) When the exchange has IT issues, do any clients get preferential access? E.g., when the exchange is offline for some clients, does it ever make efforts to stay online for favored clients? D) What safeguards are in place to ensure client information isn’t leaked to other clients? E) If there is a margin deficiency, theft, or other shortfall, how are losses distributed and who oversees the process? 5. What mechanisms are in place to prevent and police manipulation? A) Such as: momentum ignition, denial-of-service attacks, triggering margin liquidations, collusion, spoofing, and settlement-price/benchmark manipulation. B) Are margin levels set such that manipulative traders or hackers (outside developed market jurisdictions) can’t force liquidations? C) What are the penalties and enforcement mechanisms? Are instances of manipulation disclosed to clients? 6. Does the exchange disclose and investigate security breaches? A) E.g. if the exchange suffers a suspected DOS attack, when and how is that disclosed to customers? 7. Does the exchange guarantee that its customers are not buying stolen or laundered coins? If stolen coins were bought on the exchange by an innocent customer, and reclaimed, will the customer be compensated? It [the Turbo 50x leverage product] also does not change the risk profile of Crypto Facilities as we are not a counterparty in the trades on our platform. The SEC “has determined that DAO Tokens are securities under the Securities Act of 1933.” You can read Ether’s offering documents and come to your own conclusions. I believe Kraken allows margin trading for retail customers of Ether and Tether at levels of up to 5x. I have heard anecdotally that, when the price moves in the customer’s favor, Coinbase may reject executions with error messages like “the exchange rate updated while you were waiting” — but may not always do such rejections when the price moves against the customer. The CME’s settlement price mechanism may be modified in “unusual and extreme circumstances.” The Administrator (Crypto Facilities) is responsible for making recommendations in such circumstances, and requires the approval of the CF Member of the Oversight Committee (who I think is currently the CEO of Crypto Facilities), and one of the CME’s representatives on the committee. In the Bitcoin market, I’m not sure how unusual “unusual and extreme circumstances” are. This entry was posted in Uncategorized on December 7, 2017 by Kipp Rogers. In many jurisdictions, a buyer of stolen goods does not acquire their legal title. This principle, “nemo dat“, often applies regardless of whether the buyer knows the goods were stolen. The rightful owner can sue the current holder and take possession. Bitcoins (and other cryptocurrencies) are well-known to be stolen in large quantities. Bitcoin thieves are usually hard to identify or outside the reach of developed markets’ courts, so victims believe they have no recourse. But the Bitcoin blockchain allows coins to be traced with high precision, and it seems possible for stolen coins to be returned once they re-enter the regulated domain. I’m not a lawyer and don’t understand the relevant intricacies, so this post is just intended to start a discussion. I may be wrong, but buying coins of unknown provenance could be a major risk for Bitcoin holders and intermediaries. All transfers between Bitcoin addresses are recorded and publicly accessible. In principle, this audit trail should make it easy for victims to track stolen coins and reclaim them if they enter the custody of an identifiable entity. There are, however, a few complications. Bitcoin transactions can have multiple inputs and outputs, so if only some inputs are stolen, it may be difficult to determine the portions of the outputs that should be returned. Bitcoin is frequently called “digital gold,” and perhaps that analogy is useful for tracking ownership across multi-party transactions. As a toy example, say that Tom steals 1 bar of gold from Val. Tom then melts Val’s gold, combines it with another bar of gold, and sells the two resulting bars to unsuspecting buyers, Bob and Barbara (who buy 1 bar each). How should we determine how much of Bob’s and Barbara’s purchases belong to Val? I think the intuitive choice is that each of them should return half a bar. This pro-rata allocation seems fair even though we don’t know which of the individual gold atoms were previously Val’s, or how thoroughly Tom stirred the melted gold. In some circumstances there could be documentation that suggests an alternate allocation. Suppose Tom steals a bar from Val, then entrusts it to a gold broker, who melts it with other bars. The broker then sells a bar of the blended gold to Bob on Tom’s behalf, recording a trade between them, and giving Tom the cash. Even though “Bob’s” bar doesn’t contain the same gold atoms as Val’s did, perhaps a sensible outcome is for Bob to return the entire bar to Val? If the above reasoning applies, then victims have a good chance of recovering their stolen coins. It’d be logistically complex, but I can imagine a group of victims demanding that major exchanges, custodians, and intermediaries return the appropriate amounts, if coins with certain address-chains come into their control. If enforced by a powerful court, demands like this could have serious effects on the Bitcoin market. Many people would have coins — that they innocently bought — seized. These people might then sue their counterparties and exchanges. Depending on the number of stolen Bitcoins circulating, some exchanges could go bankrupt (if they have assets within the reach of the relevant court). OTC market makers, which may account for over half of volume , could have massive liabilities to their customers. Bitcoins would have different values depending on their transaction history. Coins considered “suspicious”  or sold without a guarantee from a well-capitalized counterparty , might be worth much less than freshly mined ones. In an extreme case, the market could cease to function until the provenance of enough Bitcoins is publicly known. And perhaps future transactions would have to be fingerprinted and authenticated though an ancillary blockchain. Is it possible that it’s a crime to knowingly sell (or transmit) stolen Bitcoins? I have no understanding of this, but if you’re worried you possess stolen coins and want to sell them, you may want to consult a lawyer first. The National Stolen Property Act could apply to intangible goods, and I don’t want to hear about any readers of this blog going to jail. Established institutions are trying to make Bitcoin a more trustworthy asset. That requires knowing that marketable coins have similar values and are legitimately owned, as well as reducing the incentives of crime. There’d be some pain involved in reversing past thefts, but it may be better for the Bitcoin community to deal with these issues sooner rather than later. Some Bitcoin exchanges may not keep good records of counterparties to trades they facilitated. Perhaps the allocation method should be pro-rata in these cases, i.e. anyone with Bitcoin in the custody of such an exchange has their coins partly tainted when stolen coins are deposited at the same exchange address. This may feel unfair to the innocent depositors at the exchange, but it does seem a lot like a shady gold broker combining legitimate with stolen gold, and returning the blended product to innocent customers. Customers may feel bilked when a victim of theft reclaims gold that the customers believed was theirs, but that’s the fault of the broker, who should compensate them. This method makes particular sense in the extreme case of a Bitcoin exchange that intentionally loses records, which is arguably similar to a “mixer.” In the gold analogy, a “mixer” would melt together gold from many sources, and return the same quantities to the sources. You can certainly question the motivations of mixer-users, but even those acting in good faith probably have an idea that they might be acquiring tainted coins. Bitcoins are generally considered electronic and intangible, but some people print them out on sheets of paper. In the US, if a merchant sells goods entrusted to it in the “ordinary course of business” — whether authorized or not — the purchaser acquires the title. So perhaps if a Bitcoin exchange sold client coins to an innocent buyer on the exchange, without transferring the proceeds to the client, the buyer would acquire the title to the coins (in the US). But, if an exchange absconded with client coins and sold them later, outside the normal course of business, the victim would still own the title. Likewise for coins stolen from an exchange by a third party. This treatment could have important consequences for the missing Mt. Gox coins, worth several billion USD at current prices. We still don’t know the full story behind those coins, but it seems likely that the victims own the title in the eyes of many jurisdictions. Similar arguments have allowed lawsuits concerning allegedly misappropriated art to proceed in NY. On any given day, exchanges are reporting anywhere from $200 million to $250 million traded in a 24-hour period. OTC trading is not reported anywhere, but I’d imagine that the OTC market is larger than that number. JP Koning discusses the notion of fungibility as it relates to “nemo dat.” That is, if “nemo dat” applied to legal tender, identical units of currency would have different (and hard to ascertain) values depending on their history. If only one jurisdiction applies “nemo dat” to Bitcoin, then its value could become unstandardized everywhere. Especially high-risk coins might include the Silk Road coins auctioned by the US Marshals. The US Government said that Ross Ulbricht “is the only person or entity reasonably believed to be a potential claimant to the Computer Hardware Bitcoins.” I don’t know how civil forfeiture works, so maybe this doesn’t matter at all, but isn’t there at least a chance some of those coins didn’t belong to him? Ulbricht was convicted of charges related to drug-dealing, hacking, and money-laundering. I’m not sure it’d be a surprise if something in his possession had been stolen. GBTC, a Bitcoin-holding trust listed on OTC Markets, bought 48,000 BTC from this source. Cumberland reportedly bought 27,000 BTC. Tim Draper bought around 30,000 of “these bitcoins with a tainted past,” and deployed them at market maker and exchange Mirror. Exchange itBit, which will form part of the settlement price for CME Bitcoin futures, bought 13,000 BTC. I don’t know if OTC market makers keep large cash reserves, but perhaps some clients patronize them because they offer more reliable protections in case they accidentally sell illegitimate Bitcoins. I can imagine a situation where clients purchasing Bitcoin require market makers to post margin as an additional protection; and conversely market makers could require margin when buying coins from clients. This entry was posted in Uncategorized on November 5, 2017 by Kipp Rogers. For the Opening/Closing Auction, non-displayed buy (sell) orders on the Continuous Book with a resting price within the Reference Price Range will be priced at the Protected NBB (NBO) for the purpose of determining the clearing price, but will be ranked and eligible for execution in the Opening/Closing Auction match at the order’s resting price. Now, I’m not easily surprised by complex exchange logic, but this got my attention. Again, I may have misunderstood something, but if I haven’t, this logic could be controversial with long-term traders once they familiarize themselves with IEX auctions. LOC order to sell 1,000 shares with a limit price of $10.10. 1,000 shares would execute at the IEX Official Closing Price of $10.10. My understanding is that a hidden order submitted after these LOC orders could gain priority without providing a better price. If the NBBO were 10.09/10.13, and someone submitted a hidden bid at $10.11 100ms before the auction, I believe IEX’s auction logic would still price the auction at $10.10  — but the hidden order would be executed in place of the LOC bid. This may feel “unfair” because the hidden order was submitted long after the LOC order and had virtually zero risk of moving the matching price (because the hidden bid is priced at the $10.09 “for the purpose of determining the clearing price”). And unlike LOC (or MOC) orders, the hidden order does not have a “no-cancel” period, so could be canceled even 1ms before the auction. Under certain conditions, this functionality gives traders the opportunity to simultaneously gain priority while offering a less competitive price, a rare confluence in normal markets. One reason why traders submit LOC/MOC orders (and displayed orders) is because they want to announce their intentions to attract liquidity. IEX’s hidden order logic shouldn’t change that. But other auction traders only announce their intentions because they want priority. This latter group may find the advantages of hidden orders hard to resist. After the final opportunity to submit LOC/MOC orders, a closing auction has a big sell imbalance: there is 1 LOC buy at $10.00 for 1,000 shares, and 1 LOC sell at $10.00 for 10,000 shares. In the remaining 10 seconds of the day, traders will compete to trade with the sell imbalance. On IEX, the only way they can do so is by using displayed and undisplayed orders. Maybe 10ms before the close, the NBBO is $10.05/$10.07 (with all displayed quantity on IEX). The bidder at $10.05 realizes they can get a better price and better priority in the auction by deleting their displayed order and resubmitting a hidden buy order at $10.06. They do so, and the NBBO is now $10.04/$10.07. The bidder at $10.04 does the same thing. Likewise those at $10.03, $10.02, and $10.01. The NBBO is now $10.00/$10.07. To be clear, I wouldn’t say that this feature is scandalous. The behavior (I think) is fully disclosed, and professional traders should always read the manual before using any exchange. But issuers are probably not equipped to do that. And if IEX wants its auction to be “simple,” I’m not sure this is the right approach. It’s hard for me to completely understand IEX’s documentation. It has some clear errors in it — such as the “CLEARING PRICE EXAMPLES,” which say “Each example below assumes the Protected NBBO is $10.09 by $10.11 at the time of the Closing Auction,” but “Example 3” has displayed limit orders on IEX at $10.12 (buy) and $10.13 (sell) — so something is not quite right. Even aside from errors in the documentation, I may have made errors interpreting it. I don’t mean to write so much about IEX, but functionality like this has not gotten the attention it deserves. If more than one price maximizes the number of shares that will execute, resulting in an auction price range, the Reference Price is set to the price at or within such range that is not lower (higher) than the most aggressive unexecuted buy (sell) order. Which I think guarantees that even if the LOC bid at $10.10 is skipped-over and doesn’t receive an execution, it will still affect the auction price. I suppose this is better than performing the auction at $10.09, but it will still frustrate the LOC-sender who missed their execution and moved the closing price. Midpoint Peg order to buy 2,500 shares with a resting price of $20.20. LOC order to sell 2,000 shares with a limit price of 20.18. The LOC buy order would not receive an execution, because the LOC sell order is fully filled after matching with the Midpoint Peg buy order with superior priority. It also seems potentially risky to have the auction price depend other exchanges’ order books. If somebody submits a 100-share order on another exchange, they could potentially move the IEX open or close by multiple ticks. Even ignoring the possibility of manipulation, it might not be the best idea for an important cross to be sensitive to small orders that aren’t eligible to participate in that cross. NYSE learned this the hard way after Rule 48 probably contributed to the market disruption on Aug. 24, 2015. [*] I have edited this example because I made an error in the original version. The LOC bid in the original version was at $10.10. In that circumstance, the LOC bid at $10.10 *would* get fully filled at $10.00 (because it’s more aggressively priced than the hidden orders), in contrast to what happens to the LOC bid at $10.00 in our example. This entry was posted in Uncategorized on September 20, 2017 by Kipp Rogers. 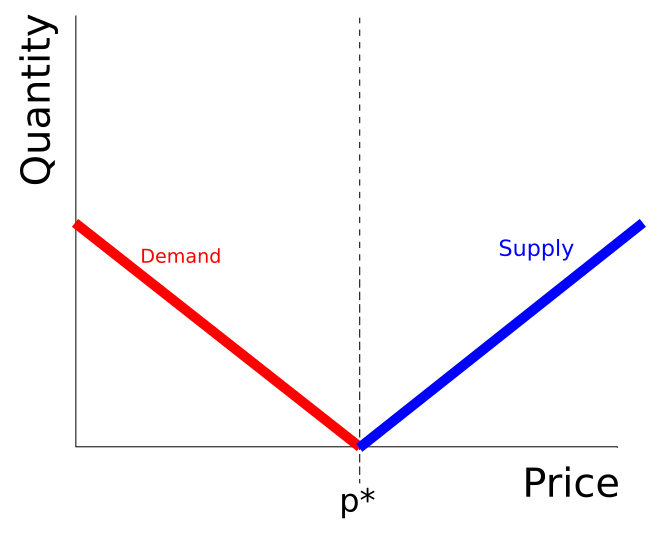 A central challenge in economics is understanding how price affects the quantity of supply and demand, a relationship often assumed to be approximately linear. But there are markets where this notion of linearity, sometimes called “elasticity,” may not hold. In a paper that deserves more attention, Donier and Bouchaud show that supply/demand curves of rapidly clearing markets (with a Brownian price process) have an average shape that is locally quadratic, with no linear term. Total demand decreases — and total supply increases — monotonically with price. The curves intersect at , which is the volume-maximizing, market price. Near the market price, supply and demand vary linearly with changes in price. In this regime, a market order will have price impact that scales with the square-root of its size, on average. Where is the rough width of the “saddle zone,” the region where the curves are predominantly quadratic. New buy orders are created (in time interval ) with probability , where is the difference between the price of the new order ( ) and the market price ( ). Sell orders are created with probability . Existing orders are canceled with probability . The market clears with periodic time-interval — when buy and sell orders with crossing prices are matched, and removed from the market. The underlying process of the price is Brownian. When is small, they show that supply and demand curves are locally quadratic, for any reasonable and . Nonetheless, it is conceivable that some markets behave as if they’re in the small limit. In the Bitcoin market, traders may be less inclined to hide their intentions than in traditional markets, and the visible order book might represent the true levels of supply and demand near the market price. 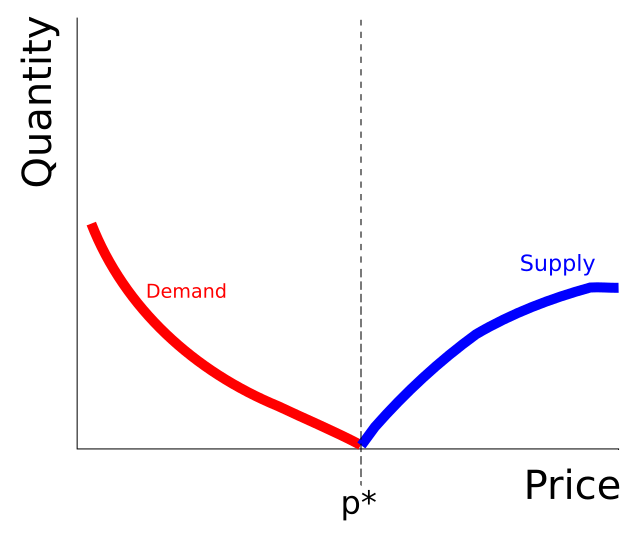 The authors present the average displayed supply and demand for Bitcoin in Figure 6, which is very close to a quadratic function for prices within 2% of the clearing price (where cumulative supply/demand is typically ~400k BTC). So electronic markets’ “saddle zones” may be about as wide as their daily volatility, which doesn’t seem surprising; few oil producers are going to increase drilling because the price went up by 1%. Donier and Bouchaud’s result seems to be a general feature of Brownian price processes, and doesn’t depend much on the specifics of the model. The spirit of their model raises the question whether there’s a connection between the marginal supply/demand at a given price, and the time required for the market to move through that price. That is, perhaps latent liquidity has properties similar to first-passage time statistics. 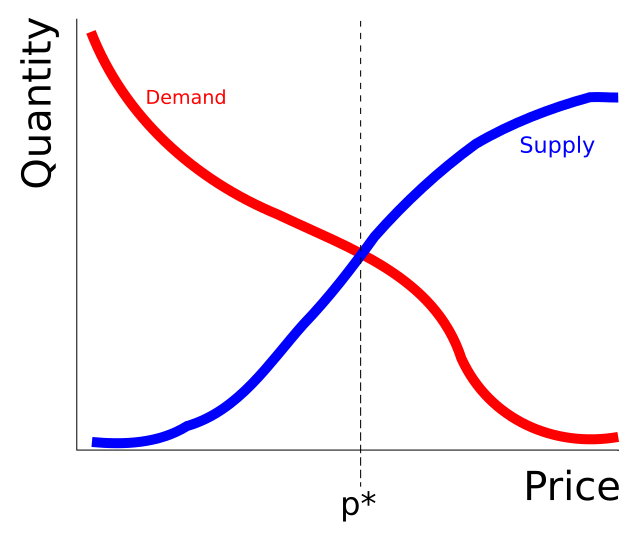 A quadratic supply/demand curve is equivalent to marginal supply/demand varying linearly with price. By definition, cumulative supply ( ) at a price away from the “true” price is just the sum of marginal supply ( ) available up to that price: . 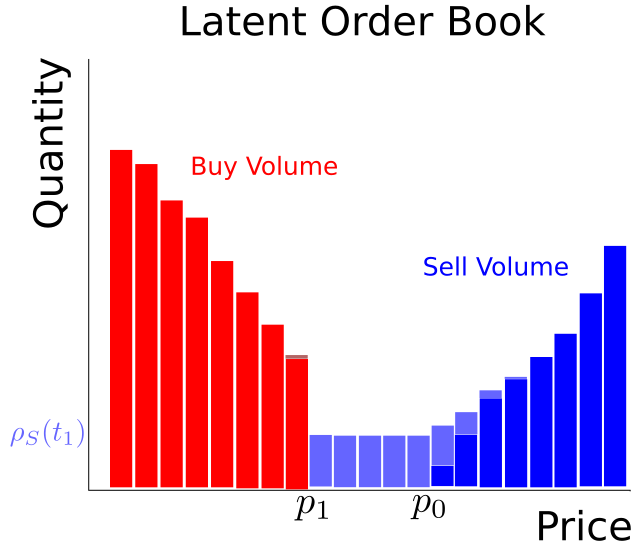 may also be called the volume of latent sell orders available at price . One way to reach Donier and Bouchaud’s result is by assuming that builds with time, after the market price moves through . To be clear, the following model is different and less sophisticated than what Donier and Bouchaud did, but I think it’s a good way to capture the intuition. Afterwards, inside this new gap, latent sell orders will start to build. Let’s assume that grows as a function only of the time since the price dropped through : . The precise form of the function doesn’t really matter. To calculate the expected value of , we need the probability density of the time since the price last passed away from the present price: . For a time-reversible process, this distribution is the same as that of the first-passage time, . Where is the total time that the market has been operating. Thus, the expected cumulative supply is quadratic in : . The model should fail at sufficiently large , when it has been a long time since the price last reached its current level. E.g., if the price of oil rises past its high for the year to $60/bbl, then we’d expect the level of marginal supply near $60 to reflect the real-world economics of oil extraction. So clearly, the model shouldn’t work for in the oil market. But if oil breached only its high-of-the-day, perhaps the marginal supply would just be a mechanical function of that duration. We could argue that the model will start to fail when is long enough for businesses to react to new highs/lows, which should be about the typical time between business decisions ( ). In that case , which could be quite large for illiquid markets. If , the market clears every period in a batch auction, and the price process becomes a discrete-time random walk. An infinitely long should recover the uncleared, classical supply/demand curves at the top of this post. So, as increases, we expect a transition from the quadratic supply of Brownian motion to a linear regime. Where is the number of steps the random walk has taken, and is the variance of each step’s price movement. The approximation is valid in the limit with finite. The step count is related to continuous time via . And if the underlying process is Brownian, . When the price process has a typical step size ( ) that’s small compared to the distance from the market price ( ), then the second term dominates and is identical to the continuous Brownian case. That is, cumulative supply varies quadratically with price when . When the process is heavily discretized, is small compared to and the first term dominates, which will be approximately constant in . Thus the marginal supply will be constant, and the cumulative supply linear in . The above asymptotics apply to a broad class of random walks if their variance is finite. But markets can have price fluctuations with fatter tails, particularly on shorter timescales. A Lévy flight of index has price increments ( ) with divergent variance and a power-law tail: . This has linear price-dependence like ordinary Brownian motion. So the cumulative supply is again quadratic, and market impact is again square-root. Certain types of “efficiency” can lead to square-root price impact. But if this model is approximately accurate, then “inefficient” markets like sub-diffusions can also have square-root impact. Update: Benzaquen and Bouchaud just examined a reaction-diffusion model for sub-diffusions. They show that the latent order book is locally linear (eq. 10), like in the crude first-passage analysis here. For quickly executed meta-orders, they show . But for slow meta-orders that give latent orders more time to react mid-execution, they get . I find this result interesting because it appears, at first glance, to contradict the simplest, order-of-magnitude “derivation” of the square-root impact law. But on closer inspection, I think order-of-magnitude logic is consistent with sub-diffusions and ordinary diffusions having similar impact scaling. If a market is Brownian, its price changes will scale like . One view of price discovery is that a fraction (of order 1) of those price changes come from traders’ impact. Thus, a meta-order’s impact will roughly scale with the square root of its duration: . Market-wide volume roughly accumulates at a constant rate in time ( ), so a meta-order of size will last for a duration . This gives . Now, if a market is sub-diffusive then its price changes scale more slowly with time: . If everything else in the above argument were the same, then we’d get . But there’s no reason to expect that volume in a sub-diffusive market should occur at a constant rate in clock-time. Sub-diffusions can be reformulated as processes with independent increments, where the time between steps is variable with a long tail. 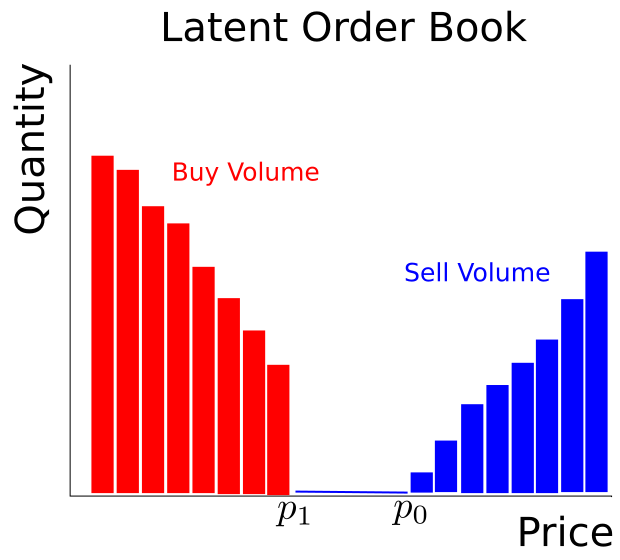 In this formulation, steps may correspond to trading activity — with each step roughly having volume . A meta-order would then last for steps, with . The step lengths of this sub-diffusion have finite variance , so we can follow the same argument as in the Brownian case, with the step count replacing time: — which has the same square-root scaling. Market-behavior is crowd-behavior, and a crowd can be more predictable than the individuals inside it. Donier and Bouchaud — and the loose interpretation in this post — show that that when markets are mechanical and boring, they will have cumulative supply and demand curves that are roughly quadratic, on average. Now, lots of us do not think markets are boring! 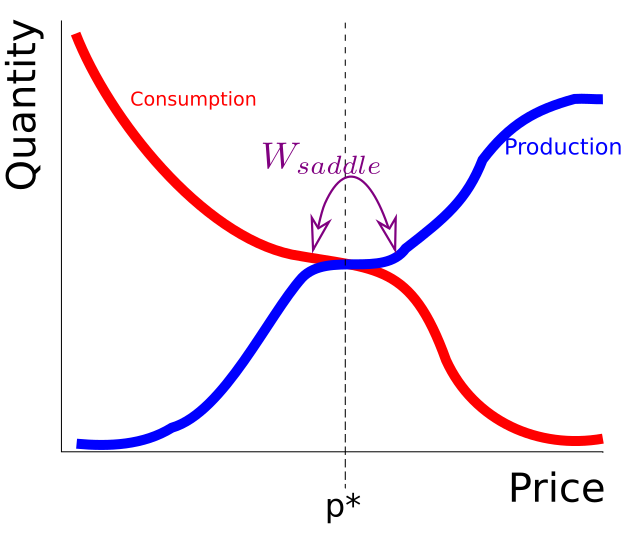 Even if many markets do operate at saddle points, they probably do not have very wide “saddle zones.” But if any do, a small price change might have virtually zero effect on production and consumption, and a large price change might have a giant effect. That’s different from the standard intuition. This picture is obviously heuristic. 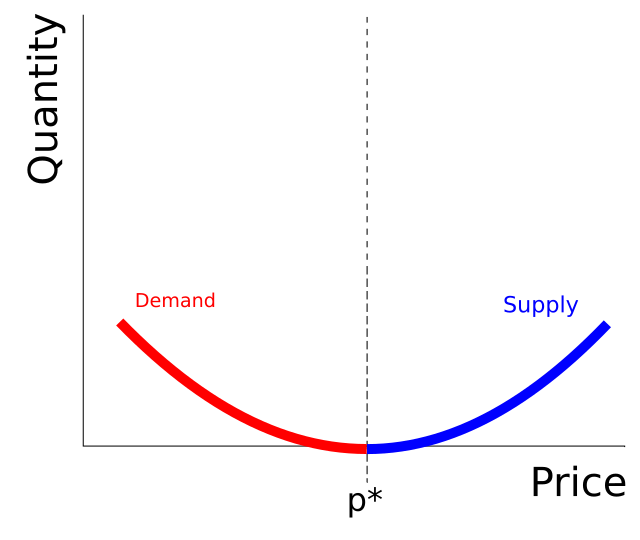 Supply/demand curves are well known to have many shapes, may be non-monotonic, and may have more than one price that locally maximizes the exchanged volume. The supply and demand curves near should (probably) be symmetric around , if we average over some ensemble of situations in a given market. Even when large price changes barely affect supply and demand, they could still serve an important economic function. The opinions and information of traders are incorporated into prices, which — when markets are transparent — provide useful signals for long-term business decisions. Table 1 and Figure 13 of Waelbroeck and Gomes indicate that the bulk of institutional equity meta-orders are shorter than a few days. Demand is similar. For ease, let’s just discuss the supply side. Latent liquidity isn’t usually observable, so we can’t easily test the hypothesis that latent liquidity at a given price builds as a function of time since the market was at that price. But latent liquidity could be measured via the order book — if a market is heavily financialized, transparent, and dominated by traders who don’t hide their intentions. Arguably, Bitcoin is (or used to be) such a market. We could add an i.i.d noise term to and it wouldn’t affect the results. The assumption that has no explicit price-dependence is similar to Donier and Bouchaud’s example of constant and . This assumption is obviously wrong, but sufficiently close to the market price, it may be reasonable enough. The reaction time of businesses could be significantly longer than the human decision-making timescale. Especially when the market in question isn’t transparent or mature. E.g., if a farmer switches from growing olives to almonds, it might take her grove several years to become productive again. So the price of almonds may need to reach a multi-year high in order for her to be confident enough to switch crops. But, if the farmer could hedge her future production, she might quickly decide to switch crops after it becomes economical to do so. Perhaps a well-developed futures market reduces the valid range of this model from to . See eq. 38 of Majumdar and citations for details. I changed the CDF of eq. 38 into a PDF, and dropped a non-leading term. Sparre-Andersen scaling applies to any Markov process with a continuous and symmetric distribution of price movements: For large , first passage time distributions have to decay like . So, in order for the expectation over to converge, we must have for large (assuming is monotonically increasing). That is, the marginal supply at a given price must grow more slowly than the square root of the time since the market was at that price. The connection between latent liquidity and first passage times won’t hold for very long , but this may provide a loose bound on how quickly latent liquidity can replenish. According to the model, slowly-clearing supply/demand curves are still dominated by the quadratic term when price movements are sufficiently large (and thus last-passage times long). But the model should fail at very long timescales, when businesses are able to react to price moves. Though, as discussed in , the model’s valid timescale could be longer if a market is slow and opaque. See, e.g., eq. 10 in Koren, et al. Figure 2 shows pretty rapid convergence to this asymptotic result after a handful of time steps. Perhaps it shouldn’t be surprising that impact is steeper than in the Brownian case. Heuristically, the Lévy tails make the market more “momentum-driven.” In a Lévy-type market, a trader who initiates a price movement could find that the market quickly moves away from her. The Lévy process used here has independent increments, but we can imagine the independence breaking down in continuous-time, “mid-increment.” I.e., it’s conceivable that momentum-traders could trade in the middle of a timestep. On a related note, Koren et al. show that the mean leapover length diverges for Lévy flights. The leapover length could be interpreted as the profit made by stop orders, *if* they execute in the middle of a price jump and are able to hit liquidity during tail events. Those are big “ifs,” but the potential to make near-infinite profit may partly explain the popularity of stop orders and short-term momentum strategies. It could also explain why traders are reluctant to post much liquidity far away from the current price. In a sub-diffusive market with low transaction costs, betting on mean-reversion is a profitable strategy. If you know of any electronic markets like this, let me know. Even if sub-diffusions are rare in electronic markets, linear combinations of different assets could still be sub-diffusive. The stereotypical “pairs trade” involves a mean-reverting spread between prices of two assets. Also, sub-diffusions may be more common in the broader, off-exchange economy than we’d naively expect. See the first non-constant term in the series expansion of eq. 30 in Metzler and Klafter (“Boundary value problems for fractional diffusion equations”). Eq. 30 is the survival probability (CDF of the first passage time), the PDF is the time derivative. The approximation is valid for . is the “fractional diffusion coefficient,” analogous to for . Note that sub-diffusions are not Markov processes, so Sparre-Andersen scaling  doesn’t apply. Liquidity must replenish more slowly than for large . Correlated waiting times may also lead to sub-diffusions in a process with independent increments. This entry was posted in Uncategorized on April 10, 2017 by Kipp Rogers.